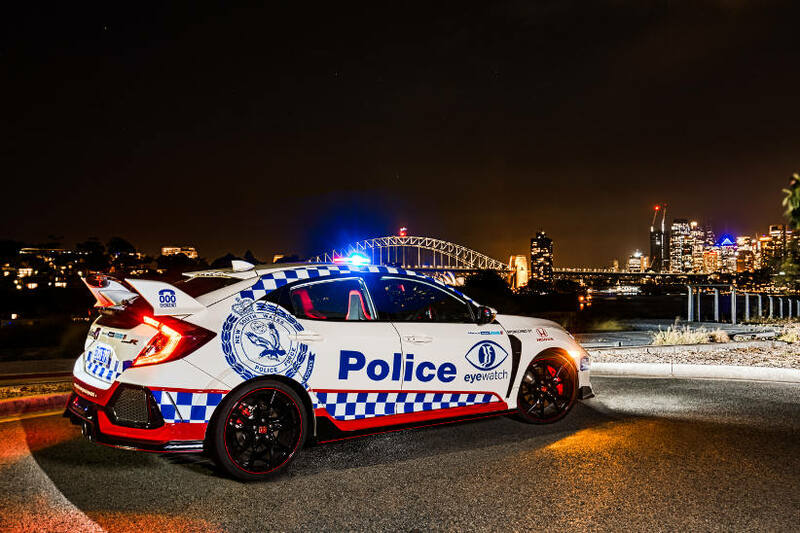 As part of a 12-month sponsored partnership between Honda Australia and the NSW Police Force, the Civic Type R has joined the Eyewatch social media initiative, which has become an important communication tool for connecting people with their local police and encouraging them to be active participants in making their communities safer. While the Civic Type R already has a powerful road presence, for its new role it has been wrapped in full ‘Police’ livery, including the distinctive ‘Eyewatch’ program logo, which is sure to see it attract plenty of attention wherever it goes throughout New South Wales over the coming months. “Honda Australia is delighted to partner with the NSW Police Force and take an active role in raising awareness of the Eyewatch program to help make our communities safer,” said Honda Australia Director, Mr. Stephen Collins. “The Civic Type R has been engineered from the ground up to deliver the most rewarding driving experience in the hot hatch segment. It has proven to be immensely popular with customers, enthusiasts and the motoring media, so we’re positive the NSW Police Force will find it to be a great community engagement tool. Police use Eyewatch to offer crime prevention and safety tips, seek community assistance to help locate missing or wanted people, and provide advice and information on local crimes, incidents and emergencies. Assistant Commissioner Joe Cassar APM, Commander of the NSW Police Force Capability, Performance and Youth Command, said the addition of the sponsored Honda Civic Type R will allow Eyewatch officers to get out and about and raise awareness of the program, and engage with local communities, especially youth. “The eye-catching design of the vehicle will hopefully be a great conversation starter while on display and get more people, especially younger people, more comfortable with approaching their local police,” Assistant Commissioner Cassar added. Leveraging its status as one of the most acclaimed hot hatches on the market today, the Civic Type R will be used by the NSW Police Force Eyewatch program at schools and community events across New South Wales throughout 2019.